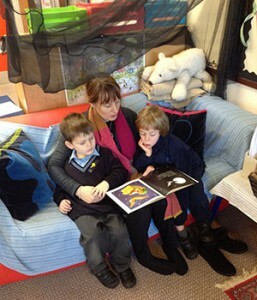 ‘Little Pedlars’ is the Early Years Unit at Sacred Heart School. We cater for Nursery and Reception age children, and parents can use their fifteen funded hours with us. Within the umbrella of the school we aim to produce happy, confident, inquisitive, caring and socially adept children who love learning and have the necessary skills and attitudes to enable them to work to their full potential now, and in the future. We do this with emphasis on the “Characteristics of Effective Learning” (EYFS). Children are provided with a wide and varied curriculum (incorporating the prime and specific areas of the EYFS). ‘Little Pedlars’ is housed within the main school and we have access to all the school facilities such as pottery/cookery rooms/gym/sport’s hall and outdoor swimming pool. We have two indoor classrooms and a further outside area attached. Access to the rest of the school grounds includes two climbing apparatus. We have the use of a small woodland space in which we experience more adventurous outside learning, such as making a fire and cooking marshmallows or sawing up sticks for the den. Children are taken on visits and visitors are welcomed to the setting in order to enhance the curriculum. Extra-curricular activities include instrument lessons and dancing. We have a lovely time. Take a look at our Brochure to see some of the things we get up to!